Digital marketing is a complex ecosystem and with technology it seems to be getting tougher with time. Making this digital marketing practise to help drive business objectives, there is a need for a structured framework. This should be built upon the data and should be able to help to get the best of return. This approach, in general known as optimization, is the discipline of applying advanced analytical methods to make better decisions. Under this framework, business goals are explicitly defined and then decisions are calibrated to optimize those goals. In the digital marketing area, this is known as digital marketing optimization (DMO). 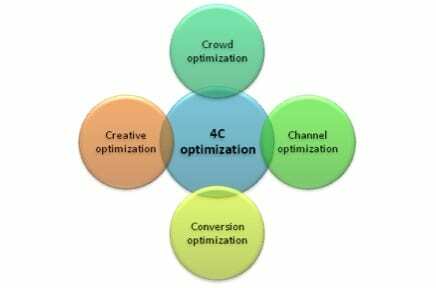 4C-Optimization is the unique approach proposed by Datapub consulting, where the goal is to help with maximization of conversions, revenues, profits, cost reduction or any combination thereof. 1) Crowd optimization: Crowd optimization is the process of identifying the group of audience which are can be the potential customers based up their shown interest in the product. This will be calculated based on the recent browsing behaviour, the amount of time spent on researching the product, demographic details along with their response rate to recent marketing communication if they been exposure recently. Statistical techniques used to calculate this are sampling, extrapolation, panel data performance, database marketing etc. Also Read Now a rap song on Analytics! 2) Channel optimization: Channel optimization is the process of optimization the traffic sources and identifying the best performing media channel or publisher or keyword group etc which are part of the digital marketing campaign plan. The need for this optimization will be calculated based on the page rank, placement position, view ability of the ad, CTR and dwell rates. The Statistical techniques used for this optimization are mediamix models, variance models, historical and benchmark performance models etc. 4) Conversion Optimization: Conversion optimization is the process is the method of creating an experience for a website or visitor with the goal of increasing the percentage of visitors that convert into customers. This is calculated based on the page load times, length of consumer journey, exit rate from conversions page, page depth, total conversions/visits etc. Statistical techniques used are A/B testing, usability test etc. This 4C optimization is an easy to implement and maintain approach and avoids the biggest hurdle of data management that is information being in silos. For more detailed information contact Datapub team.